Alpha mannosidosis is an inherited medical condition tissues and organs of the human body to function in abnormal ways. The commonly seen dysfunctions in patients suffering from this disease are distinctive facial features, intellectual disability, and skeletal abnormalities. Some of the other facial features seen amongst patients are a protruding forehead, large head, rounded eyebrows, low hairline, outsized ears, expanded jaw, flattened bridge of the nose, overgrown gums, widely spaced teeth, and outsized tongue. Though this is a rare disease, a definite rise in the population has increased the number of patients thereby augmented the demand for drugs required for treating alpha mannosidosis. Owing to this reason, the opportunity in the global market is expected to be worth US$21.8 mn by the end of 2024 as against US$2.6 mn in 2015, as the market progresses at a CAGR of 11.9% between 2017 and 2024. 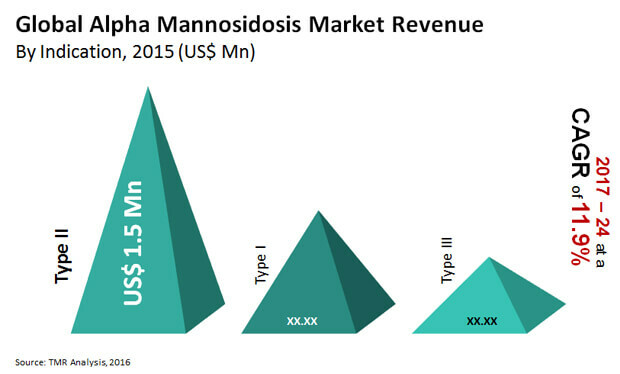 The global market for alpha mannosidosis is being driven factors such as market exclusivity being enjoyed by orphan drugs, fee reductions, tax credits, increasing investment in the rare disease treatment, and premium pricing. Statistics show that alpha mannosidosis affects one in every 10, 00,000 people across the globe. The two types of treatment available for treating this disease are bone marrow transplant (BMT) and enzyme replacement therapy (ERT). Currently, bone marrow transplant (BMT) is the most popularly used treatment for patients. However, ERT is also picking up pace as the manufacturers operating in the segment are vying for commercial roll out of therapies. A promising therapy for lysosomal storage diseases (which are similar to alpha mannosidosis) is an enzyme replacement therapy (ERT). The therapy introduces the missing enzyme in the patient’s blood stream, which is absorbed by the cells then delivered to the lysosomes. Geographically, the market has been segmented into North America, Europe, Asia Pacific, Latin America and the Middle East and Africa. Asia Pacific is projected to hold a dominant share in the market in 2017. This dominance will be attributable to the growing awareness about the disease in developing countries. Presently, the Government of Australia has implemented a national plan for helping patients with rare diseases to reduce the mortality rate due to these diseases. The plan aims to raise awareness about the burden of rare diseases among patients, its impact on social life, and healthcare professionals. North America alpha mannosidosis market is also expected to witness a remarkable growth rate in the coming years. The orphan drug law will boost the new drug discovery efforts as it aims to offer monetary as well as non-financial benefits to manufacturers. The biggest incentive offered North America is a 50% cut the cost incurred for conducting clinical trials, seven years of market exclusivity for orphan drugs, eligibility for federal research grants, and waiver of user fees. The leading players operating in the global alpha mannosidosis market is Zymenex. The company currently focusses on research and development of biologics that are designed to fight rare and life-threatening genetic diseases. The company has developed recombinant enzyme indicated for patients with alpha mannosidosis, which is known as Lamazym (velmanase alfa) in the market. With increase in the incidence of alpha mannosidosis worldwide the market for treatment is expected to grow in coming years. Alpha Mannosidosis is a rare inherited condition that leads to problems in organs and tissues of the body. The disease is of three types such as Type I, Type II and Type III. Type I is a mild form, type II is moderate form of disease and most commonly observed, whereas, type III is the severe form of disease. Alpha Mannosidosis affects 1 in every 10, 00,000 people worldwide. Alpha-mannosidosis affects men and women equally across the globe. Bone marrow transplant (BMT) and Enzyme replacement therapy (ERT) are the two treatment options for alpha mannosidosis. Bone marrow transplant (BMT) has been conventionally used universally to treat patients suffering from alpha mannosidosis. Some of the factors driving this market include market exclusivity of orphan drugs, fee reductions and tax credits, increasing investment in the rare disease treatment etc. However, the factors such as high cost of orphan drugs and lack of awareness are expected to hamper the market demand. The alpha mannosidosis market has been segmented based on treatment, indication, end-user and geography. Based on treatment, the market has been segmented into bone marrow transplant (BMT) and enzyme replacement therapy (ERT). Enzyme replacement therapy (ERT) is expected to dominate the market with a considerable share in 2017. With the expected increase in the incidence of alpha mannosidosis the market is expected to grow at a high rate in the next few years. BMT is expected to grow steadily due to the morbidity issues connected with the treatment. In terms of indication, the market has been categorized into type I, type II and type III. The market for type III segment is projected to expand at the maximum rate during the forecast period. Type II accounts for a considerable market share at present. Based on end-user, the market has been segmented into hospitals and specialty clinics. The hospitals segment dominated the market and the trend is likely to continue driven by increasing patient burden due to rise in patient burden. Geographically, the market has been segmented into five regions: North America, Europe, Asia Pacific, Latin America and Middle East and Africa. Asia Pacific is expected to dominate the market in 2017 with a considerable market share. North America and Europe also account for substantial portion of the market. The report identifies and explains key market drivers, restraints and opportunities. The report also provides Porter’s five forces analysis for comprehensive market understanding. Furthermore, market attractiveness analysis provides insights to most attractive regional markets to invest in the future. Zymenex, a company focused on R&D on biologics designed to fight rare and life-threatening genetic diseases has developed recombinant enzyme indicated for patients with alpha-Mannosidosis known as Lamazym (velmanase alfa). Zymenex has been acquired by Chiesi Farmaceutici S.p.A. Lamazym has received orphan drug designation is Europe and the U.S.